Over recent years the field of Science of Learning has increased dramatically. Unfortunately, despite claims that this work will greatly impact education, very little research makes it into teacher practice. Although the reasons for this are varied, a primary concern is the lack of a proper translation framework. 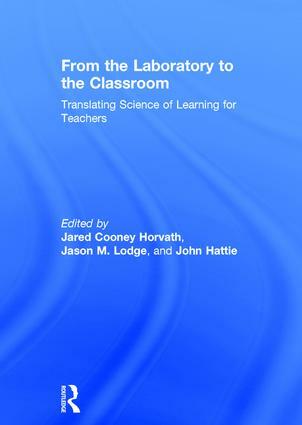 This fascinating text gathers an international team of expert scientists, teachers, and administrators to present a coherent framework for the vital translation of laboratory research for educational practice. Applying the Science of Learning framework to a number of different educational domains, it will be an essential guide for any student or researcher in education, educational psychology, neuropsychology, educational technology and the emergent field of neuroeducation. Jared Cooney Horvath is a postdoctoral researcher at the Science of Learning Research Centre, University of Melbourne, a fellow at St. Vincent’s Hospital, Melbourne, and co-founder of the Science of Learning Group—a team dedicated to bringing the latest in educationally relevant research to educators and students at all levels. Jason M. Lodge is a psychological scientist and Senior Lecturer in the Australian Research Council funded Science of Learning Research Centre and the Melbourne Centre for the Study of Higher Education, University of Melbourne. His research focuses on the application of the learning sciences to higher education and the ways in which technology is influencing learning. John Hattie is Professor and Director of the Melbourne Education Research Institute at the University of Melbourne, and Honorary Professor at the University of Auckland, New Zealand. He is the author of Visible Learning and Literacy by Corwin and Visible Learning, Visible Learning for Teachers, Visible Learning and the Science of How We Learn,Visible Learning into Action, and The International Guide to Student Achievement, all published by Routledge.